After trampling down to the court with a major sprained left ankle that Kobe stated is his worst in the past 13 seasons, the star player could miss some important games to get to the playoffs. Tonight Kobe missed a fadeaway baseline jumper and landed on the foot of Atlanta Hawks defender Dahntay Jones. After x rays came back negative on his ankle Kobe was pissed. He believe it was done purposely by Jones stating “He Jalen Rose me” back in the 2000 NBA Finals he landed on then-Indian Pacers guard and ESPN NBA analyst Jalen Rose’s foot. Rose admitted on “The Jalen Rose show” back in September that he purposely stepped under Bryant. ” I learned from street ball that if you dont give a player a clean landing you could hurt em a little bit and hurt their chances of playing a little while” Rose said tonight. Im no fan of Kobe but im no fan of purposely hurting someone and playing dirty. I watched the tape over and over just to be clear but if you see when Dahntay Jones landed he places his foot down and walks as Kobe falls down. The two have history of these type of stunts. Back in Game 4 of the 2009 Conference finals when Jones played for the Denver Nuggets he was called for a flagrant foul for tripping Bryant. Jones says it was an accident but no way should he had been underneath Kobe being that the rules changed 2 years ago. You cant walk underneath players as they are coming down its dangerous to the player. I blame the refs and the careless player because their was no foul called and someone playing dirty is just wrong. 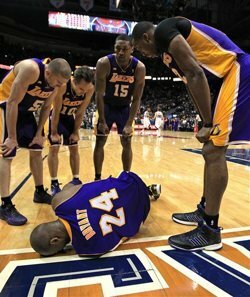 I hope that Kobe has a speedy recovery and I cant wait to watch him get his revenge. The Lakers are the 8th in the western conference, and are fighting to be in the postseason. Without Kobe in the game they could lose out on that. Magnificent items from you, man. I’ve remember your stuff previous to and you’re simply too great. I actually like what you have received right here, certainly like what you’re stating and the way in which in which you say it. You’re making it entertaining and you still take care of to keep it wise. I cant wait to learn far more from you. That is really a great web site. Hello you have a great weblog over here! Thanks for posting this interesting information for us! If you keep up this great work I’ll visit your site again. Thanks!